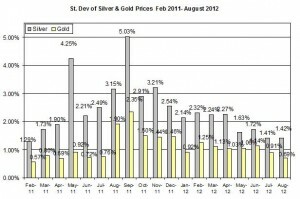 Gold and silver prices declined again for the third consecutive day. The Euro and Aussie dollar depreciated yesterday and may have contributed to the decrease of precious metals rates. Other commodities, such as oil, also decreased. The U.S jobless claims remained unchanged at 374k. Today, the symposium at Jackson Hole will conclude with the highlight will be around Bernanke’s speech as many bullion traders await to see if the Chairman of the Fed will hint of the future steps of the FOMC, i.e. will the Fed issue another quantitative easing plan. 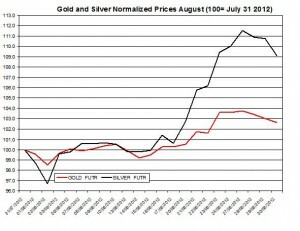 Currently, gold and silver prices are rising. On today’s agenda: U.S Factory Orders, Euro Area unemployment rate, Euro Area Inflation, Canada’s GDP and German Retail Sales. On Thursday, Gold decreased for the third consecutive day by 0.35% to $1,657; silver also declined by 1.54% to $30.45. During August, gold rose by 2.63%; silver, by 9.07%. In the chart below are the daily shifts of normalized prices of precious metals during August (normalized to 100 as of July 31st). During recent weeks gold and silver increased. The ratio between the two precious metals rose on Thursday to 54.43. 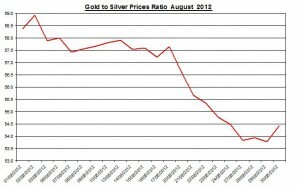 During August the ratio declined by 5.9% as gold has under-performed silver. 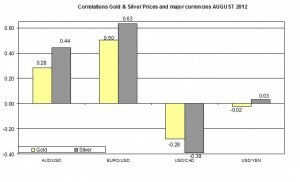 The little movement of both precious metals rates in recent months is represented in the drop in precious metals prices’ volatility during the past couple of months: during August, the standard deviations of gold and silver (daily percent changes) reached 0.69% and 1.42%, respectively. The Euro/ USD declined again on Thursday by 0.2% to 1.2506. During August (UTD) the Euro/USD rose by 1.6%. Further, other currencies including Aussie dollar also depreciated on Thursday against the USD by 0.6%. The Canadian dollar depreciated against the USD by 0.3%. 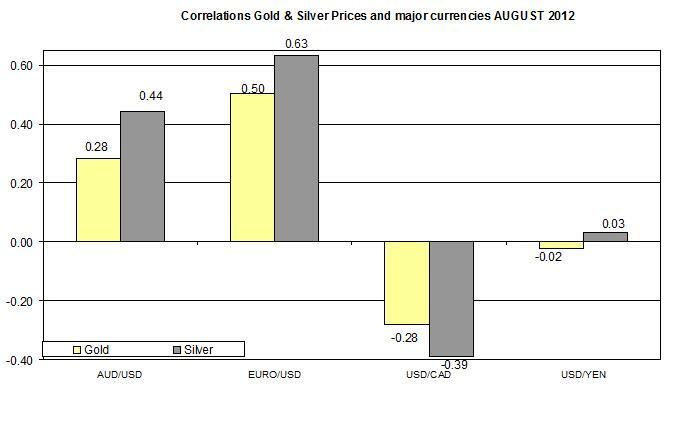 As seen in the chart below, the linear correlations among precious metals and Euro are still strong: during August, the correlation between the gold and EURO/USD reached 0.5 (daily percent changes); between gold and AUD/USD the correlation declined to 0.28. This means, if these currencies pairs will further deprecated against the USD, it could also adversely affect the prices of precious metals. Currently, the Euro/USD is edging up. Gold (September 2012 delivery) is traded at $1,660.0 per t oz. a $2.9 or 0.17% increase as of 07:42*. 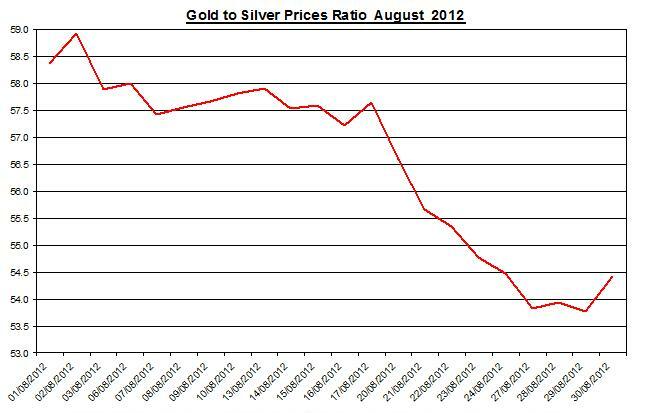 Silver (September 2012 delivery) is at $30.48 per t oz – a $0.034 or 0.11% increase as of 07:42*. The prices of precious metals decreased again on Thursday for the third consecutive day. The U.S report regarding factory orders may affect not only the USD but also bullion rates. But metals traders will continue to wait for today’s event – Bernanke’s speech that might affect the bullion market. 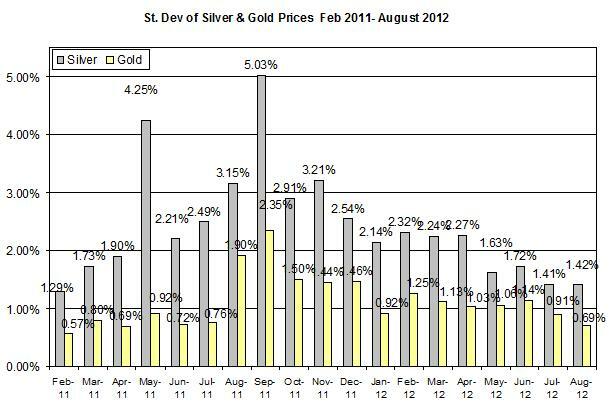 If Bernanke will hint of another QE program, it could have a strong effect on the rates of precious metals. Other reports pertaining Canada and EU, as indicated above, could affect their respective currencies, which, in turn could also affect commodities. Finally, the ongoing deprecation of the Euro and Australian dollar may have contributed to the fall of the rates of bullion. If these currencies will continue to decline, then they may drag down gold and silver.